I was smack in the middle of sewing a huge order of animal pillows this past weekend when I heard an unpleasant grinding sound in my sewing machine. I broke a gear, or at least I am assuming I did. 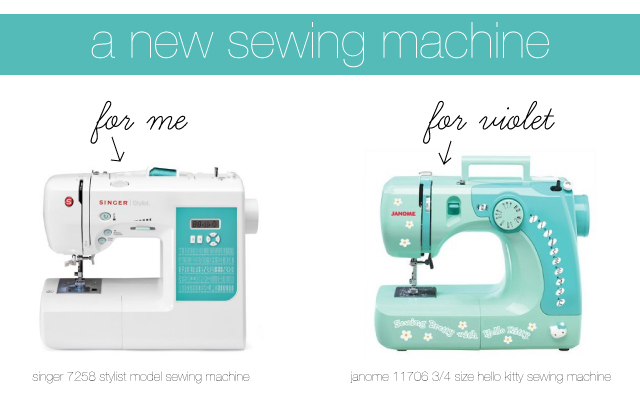 I have had my little Diana Singer sewing machine serviced a few times over the past few years, and I decided it was finally time to purchase a new machine. I purchased for myself this Singer 7258 Stylist Model sewing machine. It had really great reviews, and was said to be a "workhorse" of a machine. Sounded good to me! I wanted to buy a machine in town over the weekend, but found that the price was much better online. Then, I saw this really cute 3/4 sized Janome Hello Kitty Sewing Machine! 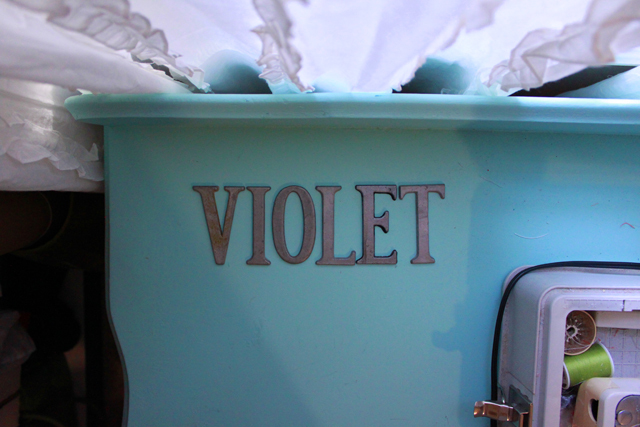 Oh, how I wish Violet was old enough to use it. She has been wanting me to teach her how to sew. But, a 3 year old handling a needle and thread doesn't sound too smart. I am so tempted to buy this machine for her now and give it to her in oh, 4 years? I have visions of us sewing animal pillows together, side by side. My machine will arrive on Thursday, so I have had to take a break from pillow making. Which is nice. I feel like I am regaining some of my sanity. Clip Schroeder's nails... he has to look purty if we are to find a new home for him! Exercise! Mama still needs to drop 10 pounds! Enlarge the waistband on this AWESOME vintage skirt I purchased! Begin work on my wholesale order for Ruche! In other completely unrelated news, I miss writing on this blog. 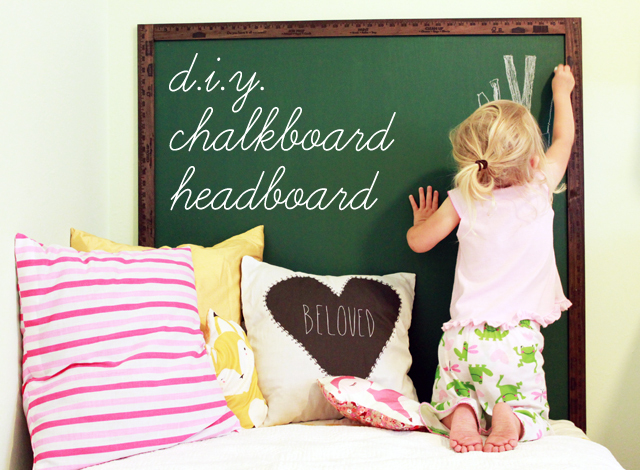 I don't have the time to invest in making it a "real" cool DIY/decorating/all-around-awesome blog at the moment. So it may just become my online journal again. I am feeling a bit stuck in my own head. Does that ever happen to you? In all honesty, I have had a lot of change in my life. Had a baby. Quit my job. Now Violet is home with me the majority of the time too. Gingiber has taken off in a great way, but golly I am feeling stretched thin. I didn't take off much time for maternity leave. And am feeling a bit burned out. Yet I am compelled to work as much as possible. Any advice on work/life balance? I know I need to take 2 days a week off, but my plate is so full now I don't feel like I can afford to, ya know? I've released a new bear pillow in 2 colors, plus a sweet mini love bear (a great little Valentines Days Gift). Also, since February is a love month, I have released a sweet love themed owl Illustration and some mini love notes (a set of 20). 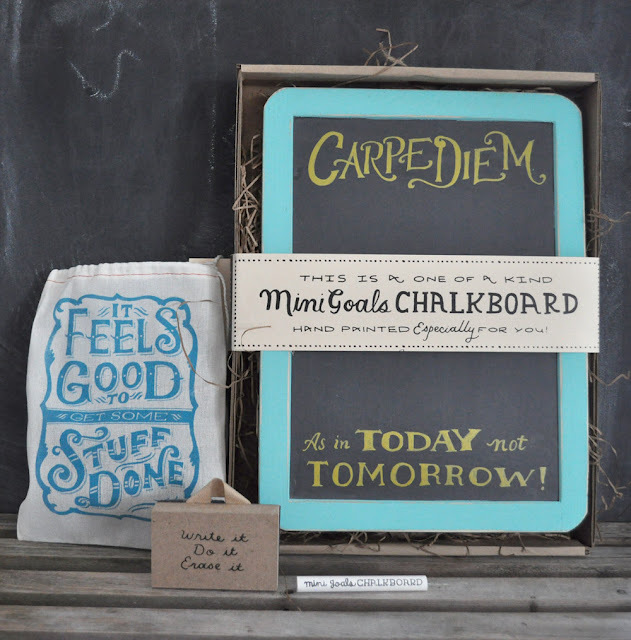 So I purchased these awesome little letters from Etsy shop OhSoRetroVintage. They are super cute, about 3 inches tall, and I really want to put them in Violet's room! Now the only problem is how to mount them? They are super thin, vintage, and I don't know if I need to glue them to a board then mount that? Or should I hang a shelf and just set them on top of it? Shadow box? I need suggestions because I am at a loss! This is the best photo I could catch of the Bloomfield girls. Oh Saturday. I long for the day when weekends are restful again. Having 2 kids is simply exhausting. But I can honestly say I am happier than I have ever been previously. Momma needs a haircut. And to buy some makeup as I have been out of everything but mascara and concealer since December. Oh, and sleep would be nice too. I have been working so much that I finally made myself stop on Friday and relax. It was much needed and a reminder that even though I am working from home I need down time. On my birthday last week, I decided to wander over to a cute new vintage clothing shop in Fayetteville called Vintage Violet. Obviously, I could not resist their adorable moniker, so I did some real shopping! I tried on clothes and everything :) Now, I still have 10 pounds to go until I reach my goal post pregnancy weight, and golly even then I will still be a size 12. But the great thing about vintage clothing is that it is cut for real women! 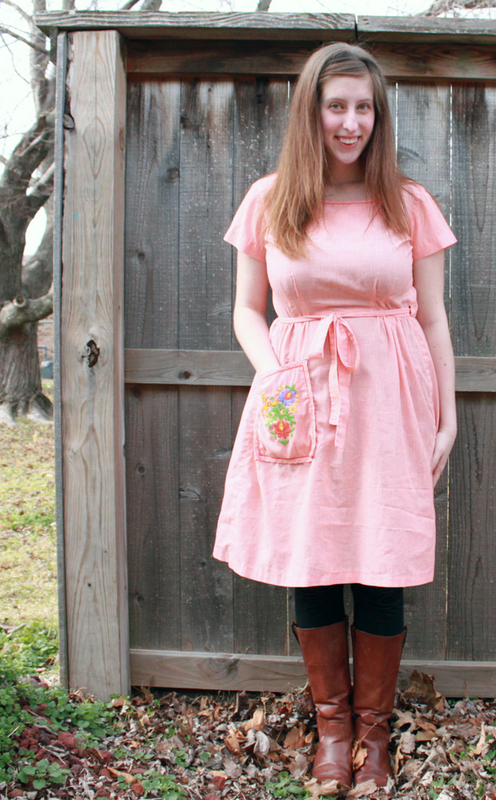 Take this adorable 1950's vintage Apron Dress! 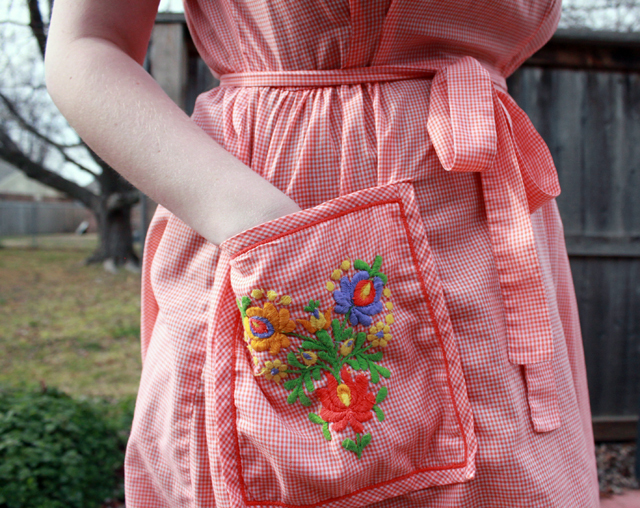 I love the orange gingham check and the embroidered pocket. But must of all I love that it was cut for a woman with curves, not a stick! The dress is thin so I have to wear a slip or some sort of camisole under it. But I think it is cute as a button. And it was less than $20 clams, so I do I do love it! Okay, so I am not a fashion blogger. And don't expect regular outfit posts from me. But I just loved this cute dress enough that I had to share! Do you wear vintage clothing? Or even a few pieces mixed into your daily wardrobe? 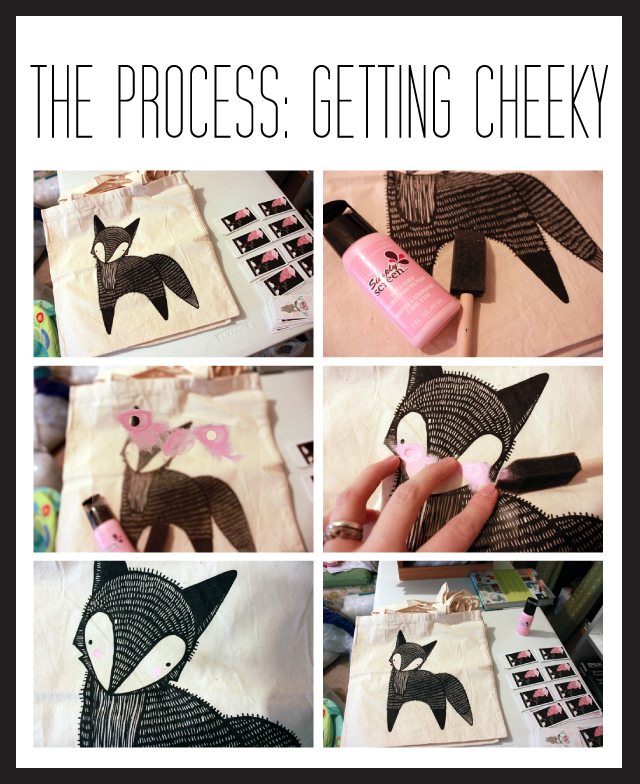 I just added this adorable Blushing Fox Tote Bag to the Gingiber Shop! If you follow me on Twitter (my handle is GingiberSnap) or on Instagram (user name Gingiber) then you saw lots of peeks into the process over the weekend! Originally, the totes were going to be just black. Then I thought that this fox needed to get cheeky. So rather than create an entire screen for silk screening cheeks, I rigged up a simple stencil using a transparency sheet, a hole punch, a foam brush, and some pink ink! What do you think? Loving the blushing fox? Or is just black the ticket? I will be honest, my days are spent mostly wiping poopy bottoms, making bottles, washing diapers, and sewing Gingiber animal pillows! Of course, there is the occasional break for blog reading :) Here's a short list of my recent go to blogs for a little daily pick-me-up! Guess what? A Gingiber Shop Update is coming soon! 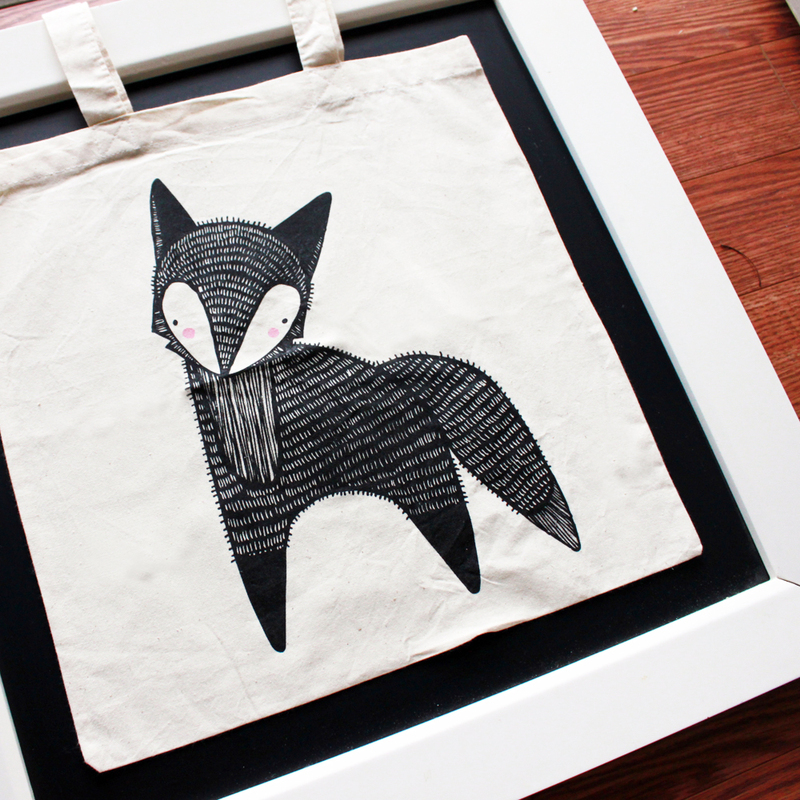 Like in 2 weeks ;) And here is a preview of a new product, a Little Fox Tote Bag! 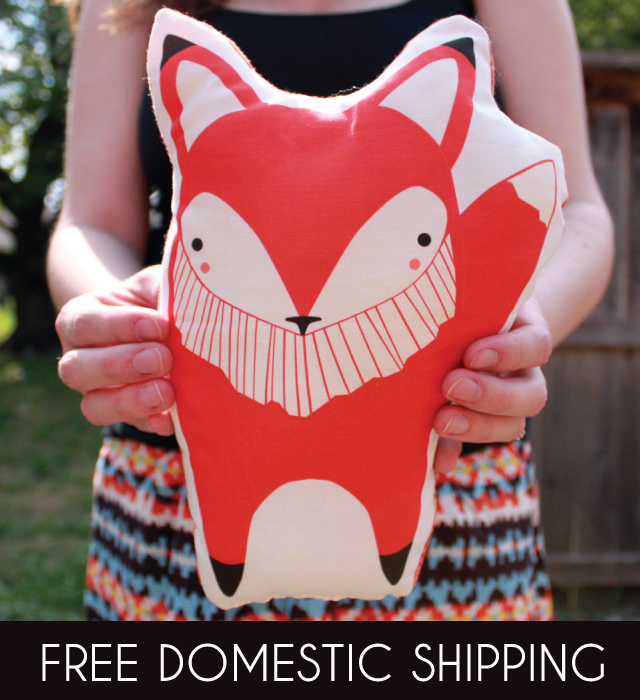 The perfect cotton tote with the sweetest little fox this side of the Mississippi! 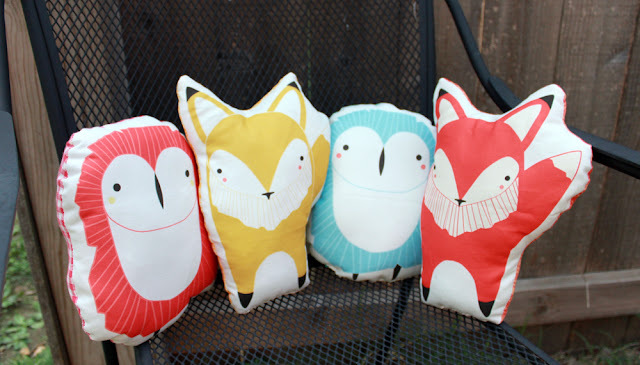 I am thinking of adding some pink little cheeks to the foxes... what do you think? Hello friends! Today is my 26th birthday, and I am celebrating with little Lucy, waiting for the rest of the little family to get home. I have had the most phenomenally blessed year of my life. And, I look forward to seeing what my 26th year has in store. 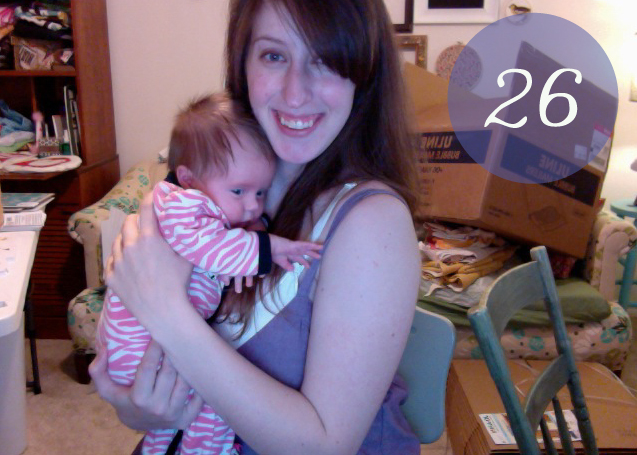 I have a few personal goals for the year, and may write a proper "26 before 27" post later on this week is over. 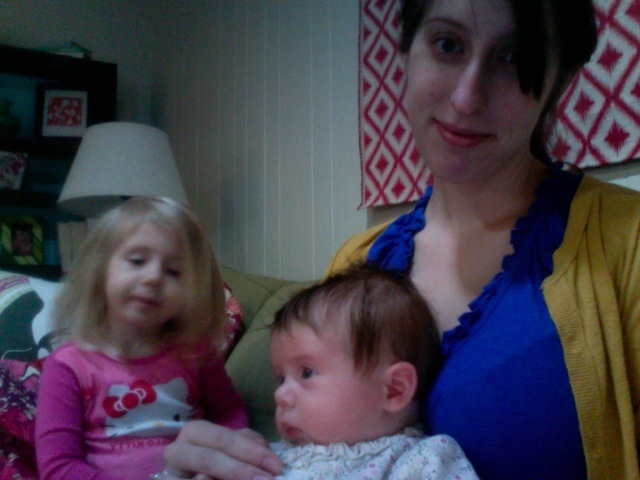 As I am now closer to 30 than 20, I want to focus on my sweet family. Now that I have 2 precious daughters, I want to become a less selfish mother. I tend to be a workaholic, and now that Violet is older, I need to find a way to put her needs before my own. Because that is what being a parent is all about, right? 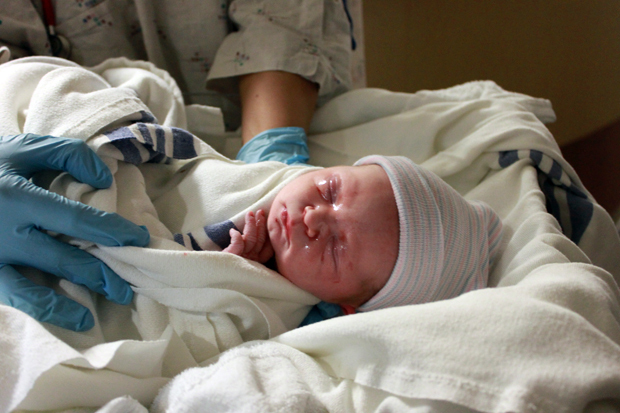 This morning I was lying in bed, Lucy cradled in my arms, I was thinking of my own mother. All I wanted to do was call my mom and chat with her, because she always knows how to cheer me up and encourage me. She knows me so well. She is selfless and somehow knows how to make the small things in life magical. Every birthday growing up with her was magical because she made it that way. Breakfast in bed. A special handpicked present. Dinner with the family. 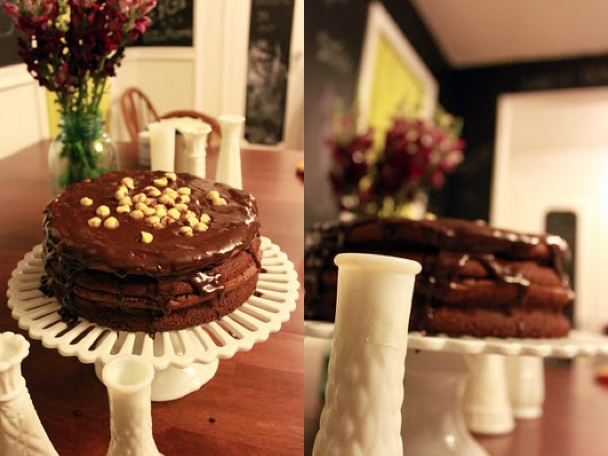 Homemade cake. It never occurred to me how much effort my mother put into making my sister and I feel so special and loved. Yet she made it seem effortless. I want to be that kind of mother to my girls. Finding the sparkle in the mundane things of life. Celebrating special moments with creativity and love. Funny how the older I get, the more I cherish my friendship with my own mom. Here's to turning 26, and growing with grace, striving to become more like my own mother. 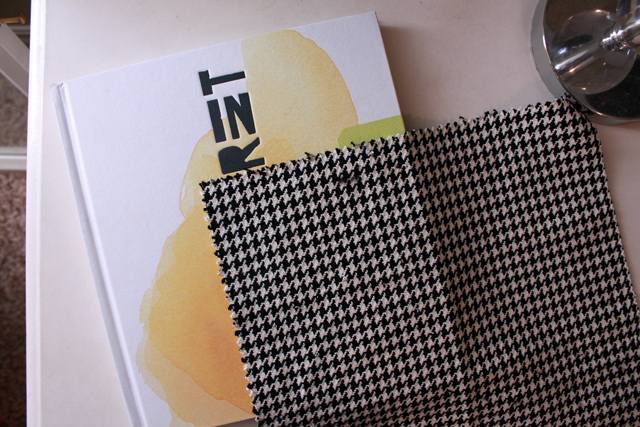 But now I am definitely lacking some houndstooth in my life :( The pattern is the epitome of classiness. And it would look so lovely on a nice arm chair, don't you agree? I have this old arm chair. Covered in nifty but dizzying Alexander Henry fabric. You know that's good, but not classy. 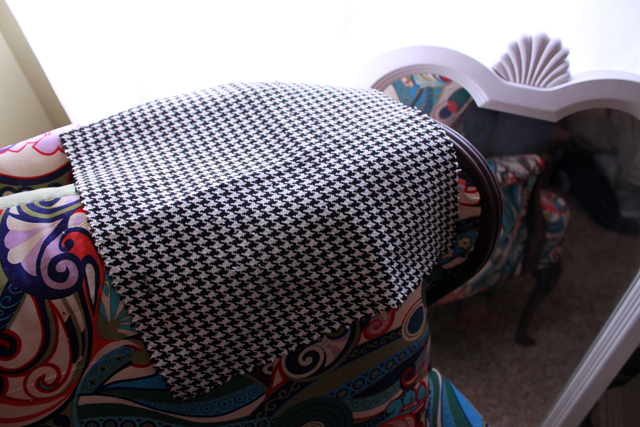 I need something classy (channeling Michael Scott from The Office), so a houndstooth upholstery job it will be! What does this have to do with getting my groove back? 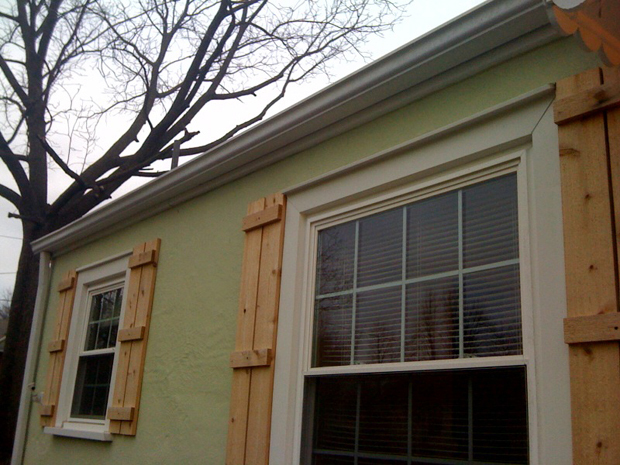 Aside from needing some content for this little blog of mine, this has inspired me to tackle one home project a month. It could be small, like hanging some curtains or sewing a pillow cover, or BIG, like say, stripping down and painting a nice piece of furniture! The sky's the limit! Do you have any monthly goals for yourself creatively? 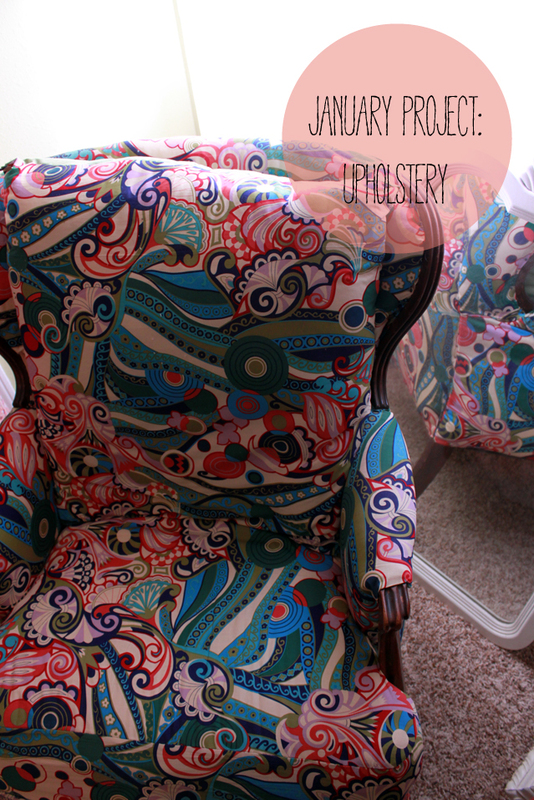 Are you a home decorating junkie, like me? Always on the lookout for a way to jazz up your home? Dont miss out on a special 1 day offer! Free Domestic Shipping on all Gingiber Products! Use discount code "FREESHIPPING" during Checkout! 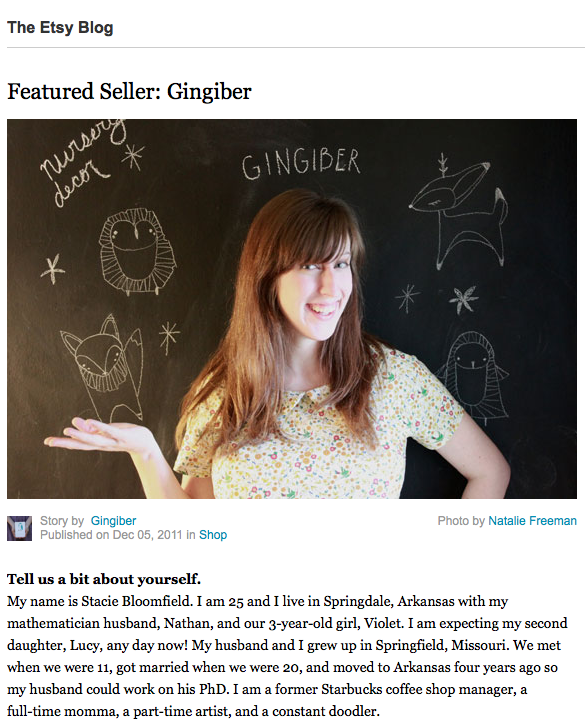 I really hope that you make your way to the good old Gingiber Shop and buy buy buy! I have a corner of our dining room that has never really been functional. It is in between the kitchen table and kitchen, and usually ends up being a landing space for boxes, Violet's larger toys, or extra chairs. So, I finally decided to go "shopping" from around the house and give this corner a makeover. The first thing I did was grab this lounge beige chair from the living room. 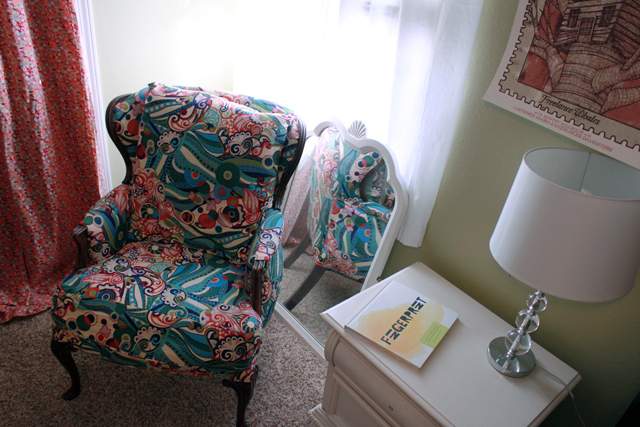 I love the chair, but it has always blended in to the beige carpet in the living room. Really, no one walks into a room and thinks, "You know what this room needs? More beige!" So I was happy to relocate the chair. 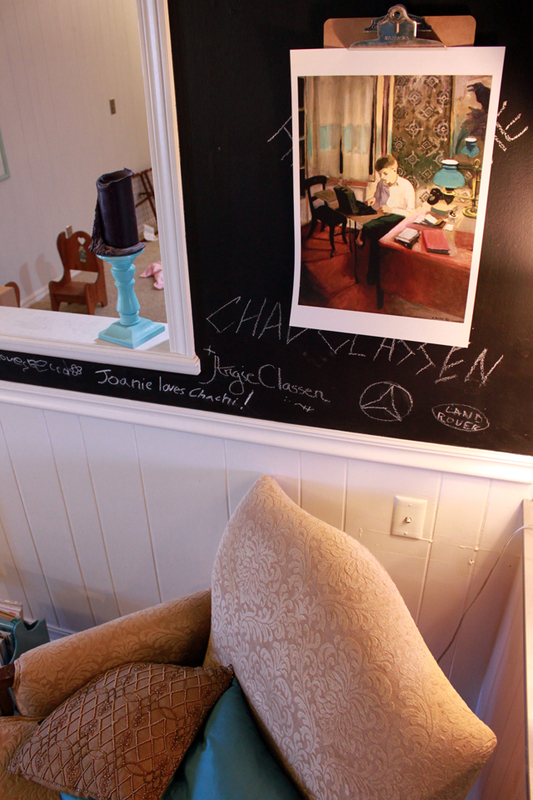 I have had this old chalkboard since college, and have had it in storage ever since Violet was a baby! 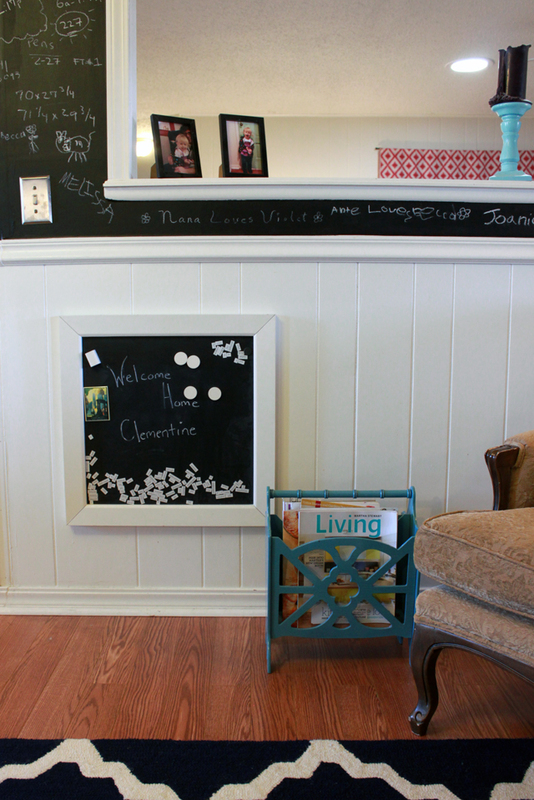 Note it says "Welcome Home Clementine" as at one point that was going to be Violet's name. (Golly I need to erase that). It balances the blank space next to the chair. 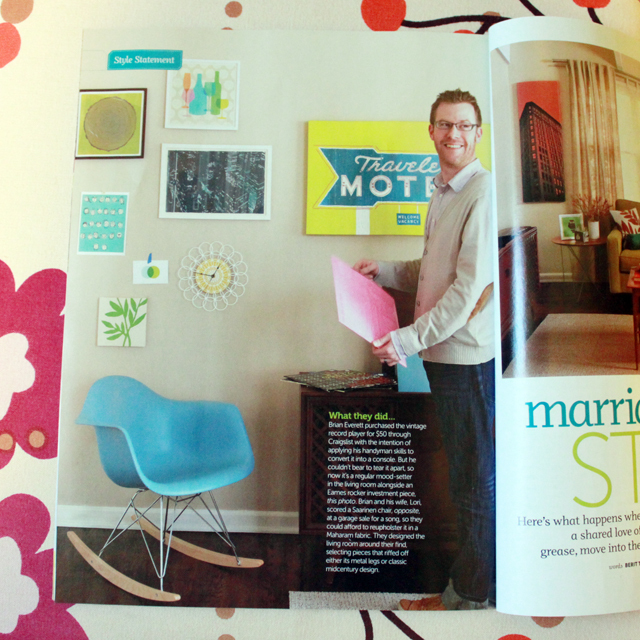 The blue magazine rack is the perfect landing spot for my back issues of Martha. And, I moved this Fairfield Porter print from the living room and hung it above the chair. Essentially, I was trying to create a more cohesive color palette throughout the kitchen/dining area. Black walls with hints of blues and greens. 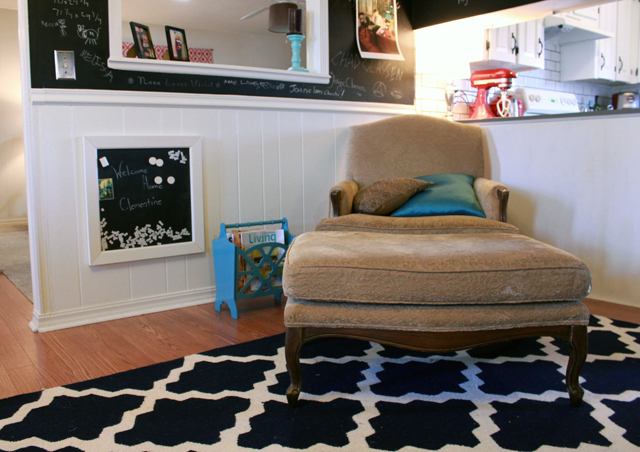 The print, accented by a blue throw pillow and navy rug work well together. This is a cozy little nook, perfect for early morning coffee or late night reading. Ant the space is filled which I LOVE! Do you ever have the urge to redecorate? Do you ever pull things from other rooms instead of hitting the stores? Now I get to work a little bit on adding some new pieces and artwork to the living room! So excited! I know that it is already 2012, but lo and behold I was fast asleep when the ball dropped last night. So here is a blog of thankfulness for 2011, arguably one of the very best and most fulfilling years of my young family's life! I turned 25 and made a list of goals for the year. The truth is that I have a lot still to finish, and my birthday is 10 days away! Yikers. 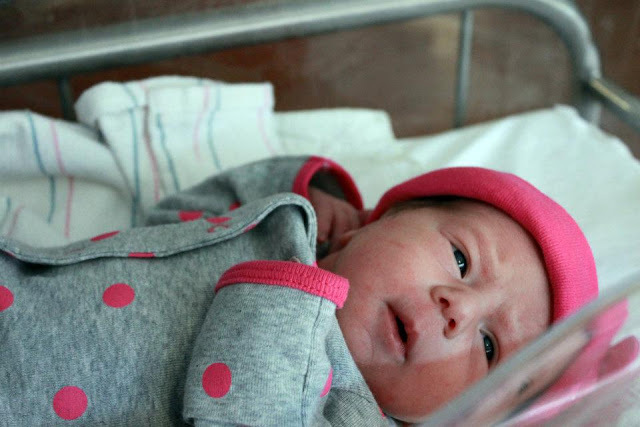 My new niece Charis was born! She is such sweet girl, is a the perfect addition to my sister's family. 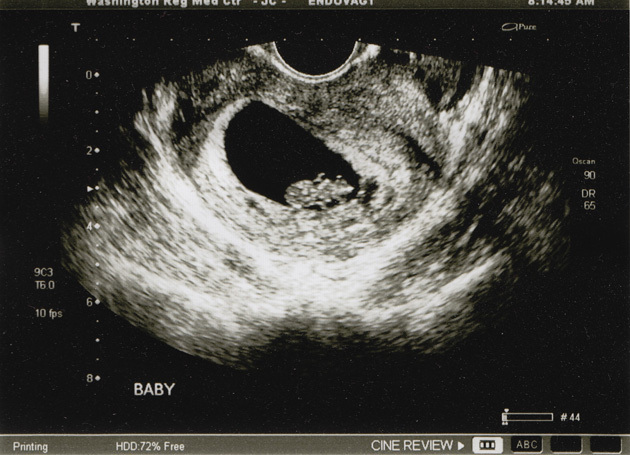 In April we announced that we were expecting another little Bloomfield! 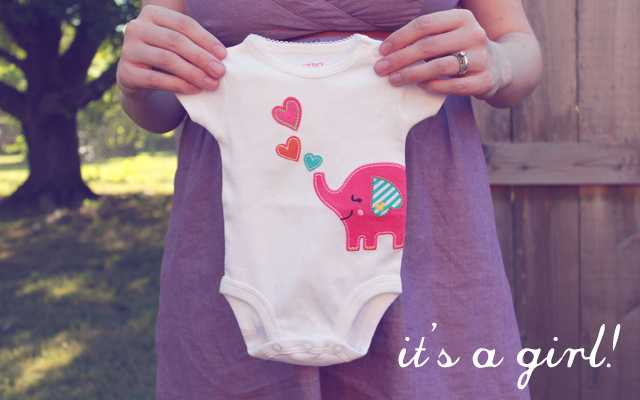 We found out that we were having another girl! My owlphabet print was in DIY Magazine! Granted it is in the background of the picture, but still it counts! 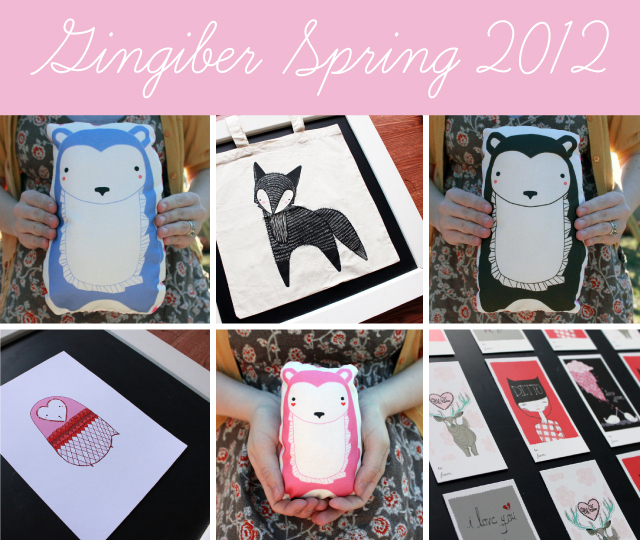 I added my line of animal pillows to the Gingiber shop in August! 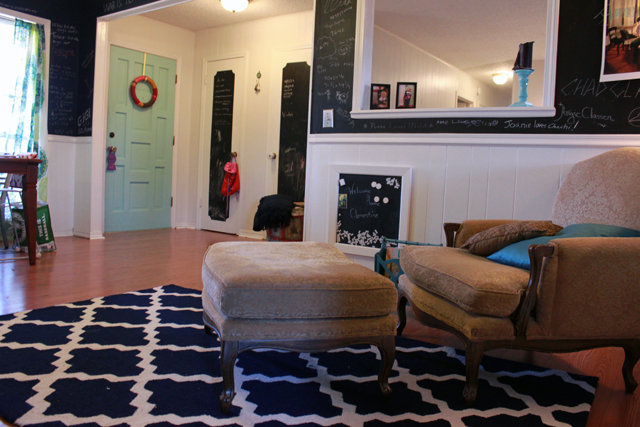 The month of September was filled with lots of decorating the girls' shared room! 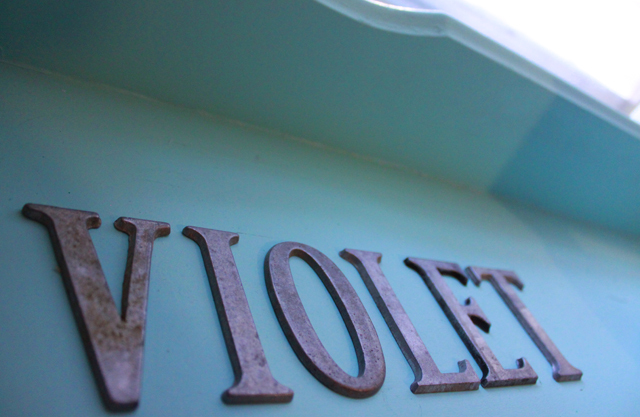 I made this headboard for Violet and she loved it! 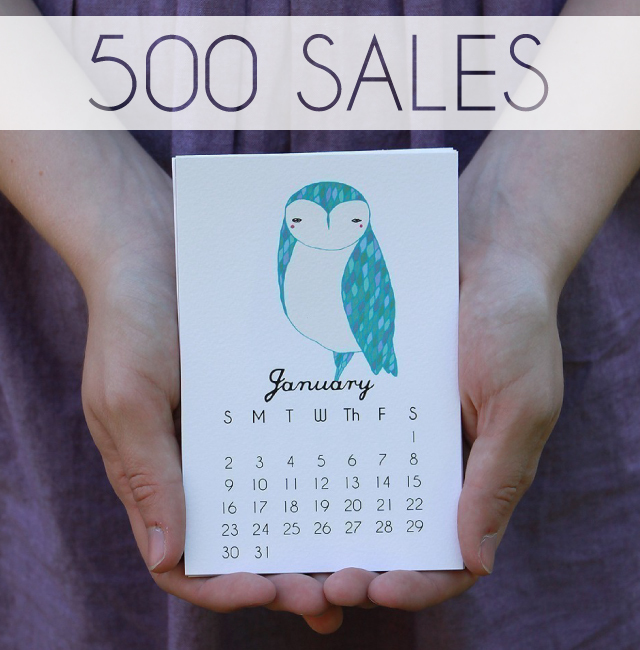 I hit 500 Etsy sales in October! 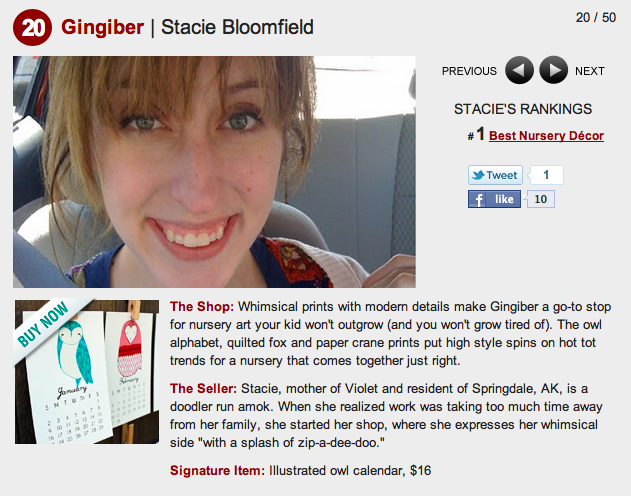 I was honored to be named the Etsy Featured Seller on Decembr 5th! Definitely a big step for my business and a dream come true! So there you have it. 2011. Amazing. Fulfilling. A year of growing. Letting go of the old, and making way for new goals and dreams. Perhaps 2012 will be even better? Be still my heart!